Do you look much older than you feel? Do you like to wear your hair in a tight ponytail because you like the mini facelift it gives you? Is your appearance affecting your confidence? Why do I need thread lifting? If you want a smoother, tighter, more youthful appearance without having to go under the knife, then thread lifting may be for you. During the procedure your skin will be gently lifted by fine surgical sutures for a subtle, instant lift. Let’s get you back to feeling fabulous again. Special absorbable surgical threads are used. These threads have small barbs on them and, when they are inserted under the skin, the barbs attach to the underside of the skin and pull the skin up when the thread is tightened. Sometimes monofilament threads are used to stimulate collagen production. After eight or so weeks these threads are dissolved by the body and are replaced by new collagen, so the results are maintained. When you visit the Skin Aesthetics clinic for your full 45-minute consultation, Dr Qian will discuss your medical history and areas of concern with you to assess whether this treatment is suitable for you. At your consultation, you’ll be able to discuss the different types of threads that are available, how they could work for you, what to expect from the process and results, and how to care for your skin before and after your treatments. You will have the opportunity to discuss any questions you have. You don’t need to go ahead with the treatment if you decide it’s not for you. What happens at my non-surgical thread lifting sessions? 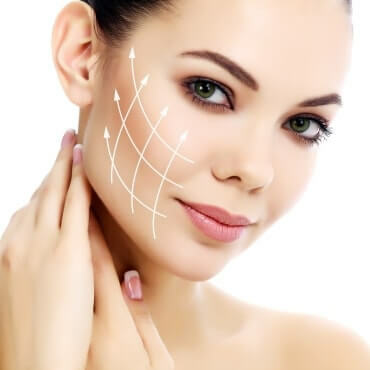 Before you have your face thread lifting treatment, your skin will be cleaned and you will be given a local anaesthetic injection at the thread entry sites. During your procedure, the skin is first pierced with a needle and then the lifting threads are inserted under your skin via a blunt needle. The entry points for the lifting threads are behind the hair line, so there are no visible marks on the face. Once the threads are in place, the needle is removed and the threads are left under the skin. As the threads are tightened, you will see an instant lift in the treatment area. Depending on the number and type of threads used, your procedure will take from 30 minutes to one hour. How does it feel to have a non-surgical face lift? You will feel some pulling and pushing, but it should not be painful. What happens after my thread lifting? Please keep the injection sites dry for 24 hours. You can wear makeup as usual because there will be no marks on the face. There is normally no bruising. You should avoid rubbing your face, try to minimise your facial expressions and sleep on your back for about three weeks after the procedure. There may be some bunching of skin which is normal and will always even out within a couple of weeks. We would normally recommend taking a couple of days off work if possible, but there is no reason why you can’t return to a desk job straight away. In the longer term, it is important that you follow a good skin care routine and wear a good sunscreen (minimum SPF 30) every day. This will help prevent premature ageing and will prolong the effect of the thread lift treatment. Dr Qian will advise you on skincare as part of your consultation. Can thread lifting give the same results as a surgical face lift? Thread lifting can give you great results if you have mild drooping and early jowls. The results would be similar to a surgical face lift. However, most people would not consider surgery at this stage. In more severe cases of drooping, thread lifting can give an improvement but the results would not be as good as surgery. However, this may still be a better option considering the lower risk profile compared to surgery. If you’d like to know more, Dr Qian will discuss this with you in detail during your consultation. Can I have thread lifting if I have had a surgical face lift before? We would not normally recommend this. After a surgical face lift there will be some scar tissue under the skin which will make thread lifting more painful and less effective. I am very anxious. Can I be sedated during the procedure? The procedure is done under local anaesthetic and should not be painful. However, if you are very anxious, Dr Qian can give you a medicine to help you relax. You can also bring a friend to help keep you calm. Is it safe to leave the threads under the skin? Yes. The PDO threads used are made of the same material as dissolvable surgical threads. Surgical threads are commonly left inside the body, have been used surgically for much longer than cosmetically and there have been no reported problems with them. The results are visible straight away and people usually love how they look. However, some patients are not used to such a big change to their face and want a more subtle result. Generally threads are over-tightened slightly because they will naturally loosen a little. If you feel that the threads are too tight, they can be massaged out and loosened (although you are likely to regret this! ).